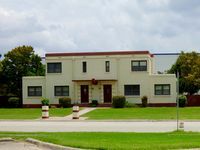 Kelly Air Force Base (1917-Active) - A United States Air Force base first established 11 Jun 1917 as Camp Kelly at San Antonio, Bexar County, Texas. Named after Lt. George E. Kelly, who was killed in an airplane crash at Fort Sam Houston on 10 May 1911. Renamed Kelly Army Air Field on 30 July 1917, known as Kelly Field. Renamed Kelly Air Force Base on 29 Jan 1948. Redesignated Lackland Air Force Base/Kelly Field Annex on 30 Sep 2001 and now active under the Joint Base San Antonio (JBSA) Lackland/Kelly Field Annex. Established in 1917 on a site selected in November 1916 by Captain Benjamin Foulois. Flying activities began at Camp Kelly on 5 Apr 1917 one day before the U.S. entered World War I. Operations expanded rapidly during the war and Kelly was divided into two locations. Kelly Number One handled maintenance and supply and later become Duncan Field. Kelly Number Two conducted flight training. Kelly became a reception center for new recruits as well as a training center for the fledgling air force. Many of the American combat aviators of World War I earned their wings at Kelly Field and formed the core of Air Force leadership. World War II expanded Kelly Field by consolidating it with Duncan Field and by adding the San Antonio Aviation Cadet Center which later become Lackland Air Force Base. All pilot flight training was shifted to other bases like nearby Brooks Field and the mission at Kelly changed to that of a logistics support base. With the creation of a separate Air Force in 1947 Kelly Field became Kelly Air Force Base and a major logistics center with worldwide responsibilities for propeller aircraft such as the B-29, B-50 and B-36. As the Air Force converted to jet aircraft, Kelly shifted to support for B-47, and B-58 bombers; F-102 and F-106 fighters; and cargo aircraft, including the huge C-5 and C-17 transports. Kelly became a major civilian employer in San Antonio and a part of a large military complex that included Fort Sam Houston, Lackland Air Force Base, Brooks Air Force Base and Randolph Air Force Base. 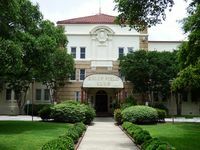 When Kelly was established in 1917 it was eight miles from San Antonio, by the 1990s it was surrounded by San Antonio and the largest employer in the city. In 1992 most of Kelly's warehouse space was transferred to the Defense Logistics Agency. In 1995 Kelly was scheduled to be closed by the Base Realignment and Closure (BRAC) commission. The implementation of the BRAC commission report resulted in the creation of a shared use of the Kelly runway complex by the Air Force and the Port of San Antonio. The Air Force retained a portion of the old Kelly AFB adjacent to Lackland Air Force Base as Lackland Air Force Base/Kelly Field Annex and while once Lackland had been a part of Kelly, Kelly became a part of Lackland. The remaining parts of Kelly are now active as Joint Base San Antonio (JBSA) Lackland/Kelly Field Annex. Two Texas state markers. Location: Joint Base San Antonio (JBSA) Lackland/Kelly Field Annex, San Antonio, Bexar County, Texas.